Established in 2003 Edwards Commercial Cleaning is a family owned company that provide a range of cleaning services to businesses across the North East and Yorkshire. 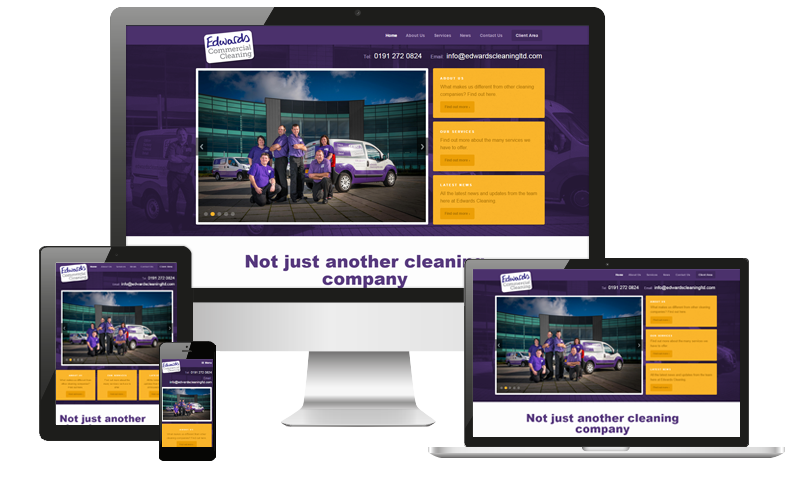 We were approached by Edwards Commercial Cleaning to create a new site design that would better reflect their business and also would allow them to provide information to customers and employees when they logged into the website. After an initial meeting it became clear that they had done their research and had already prepared a sitemap detailing all of the pages they wished to have on the site. Working closely with their existing brand guidelines, we developed wireframes and visual designs to show how the site would look and how users would navigate seamlessly from one section to another. Once the designs were signed off we moved on to building the website into a content management system to allow Edwards Cleaning to quickly add new pages and content allowing the site the flexibility to grow with the company. Additional to the website design we developed a login area which had different user access levels for employees, existing customers and potential clients, meeting their requirement of only allowing certain visitors to access more sensitive information about the company.